(Newser) – Medical experts and lawmakers are becoming increasingly concerned about health dangers radioactive cancer patients pose to fellow citizens, particularly to pregnant women and children. People treated for thyroid cancer are given radioactive iodine, which can potentially present dangerous levels of radiation to those near them for up to a week. 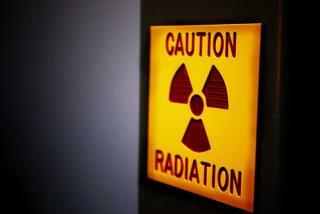 There are some 40,000 new cases of thyroid cancer a year, and most are treated with radiation. The Nuclear Regulatory Agency dropped requirements in 1997 that such patients be quarantined for a time, allowing them to return to the public or their families immediately after treatment. One such patient on a bus set off a radiation alarm in the Lincoln Tunnel. A second-hand dose could be up to four times the safe level recommended for a pregnant woman, notes the New York Times. “My investigation has led me to conclude that the levels of unintentional radiation" from patients "receiving ‘drive through’ radiation treatments may well exceed international safe levels established for pregnant women and children,” said Mass. Rep. Edward Markey. The NRC is re-examining the issue and a spokesman said the organization may have made a mistake when it dropped the quarantine requirement. What would we ever do without "The Crises Du Jour" ? The risk is *extremely minimal*. File this non-story under *sensationalism for a slow news day*.